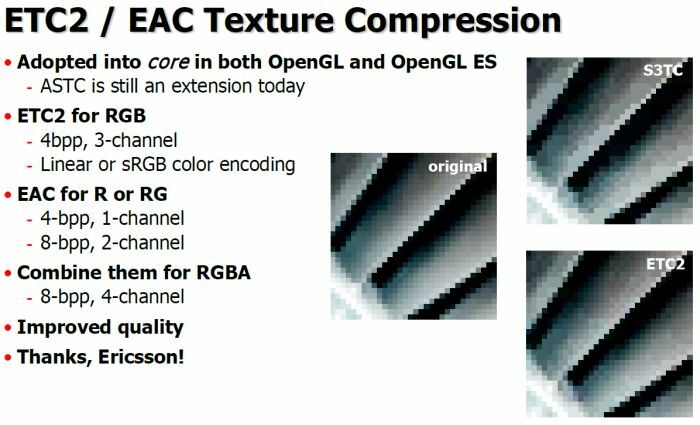 Adaptive Scalable Texture Compression (ASTC) is a new texture compression technology that offers unprecendented flexibility, while producing better or comparable results than existing texture compressions at all bit rates. It includes support for 2D and 3D textures, with low and high dynamic range, at bitrates from below 1 bit/pixel up to 8 bits/pixel in fine steps. The goal of this extension is to support the 2D, LDR-only (LDR: Low Dynamic Range) profile of the ASTC texture compression specification. More information about ASTC (LDR version) can be found in the GL_KHR_compressed_texture_astc_ldr OpenGL extension. August 6th, 2012 – Los Angeles, SIGGRAPH 2012 – The Khronos™ Group today announced the immediate release of the royalty-free, Adaptive Scalable Texture Compression (ASTC™) LDR extension specification, defining a new, highly flexible texture compression scheme for developers using both the OpenGL® ES and OpenGL® 3D graphics APIs. 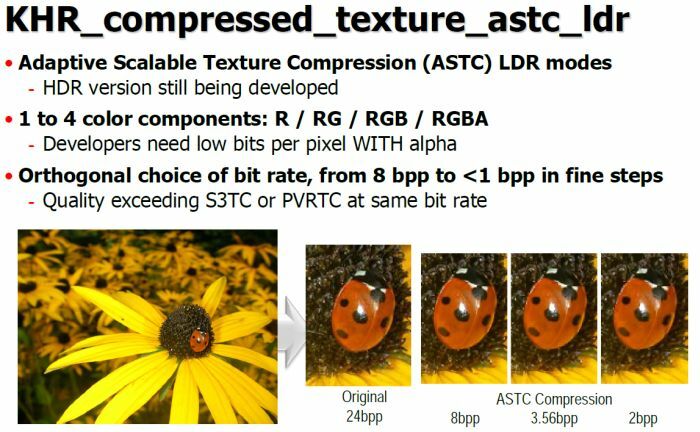 ASTC is an exceptionally efficient compression technology which allows encoding of for a wide variety of texture formats at bit-rates of 8 bits per pixel to below 1 bit per pixel. ASTC is published as a Khronos extension, HR_compressed_texture_astc_ldr, which is available from the Khronos website at www.khronos.org/registry/gles/. Aras Pranckevičius from game engine provider Unity 3D said: “ASTC is awesome! Texture compression that is higher quality, lower bitrate and with more control than any existing compression formats? Yes please!” ASTC supports monochrome, luminance-alpha, RGB and RGBA formats, as well as X+Y and XY+Z formats for surface normals, and provides the flexibility for any format to be encoded at any bit rate. Uniquely, the encoding method is chosen independently for each block of pixels in the image, so that the coding adapts dynamically to most efficiently represent the image region-by-region. Advanced fractional-bit encoding and dynamic tradeoffs between the different types of data in each block means that ASTC outperforms all currently available texture compression schemes in image quality, and GPU power consumption, while processing compressed textures. Nvidia has released Nvidia GeForce 305.53 OpenGL 4.3 developer beta drivers. Hmm, still need hardware decoding support otherwise will be useless. Perhaps next gen GPUs will have hardware support.